BEIJING, Aug. 25 (Xinhua) -- Chinese Vice Premier Sun Chunlan has asked for more effort to ensure the preservation and development of traditional Chinese medicine (TCM). Sun made the remarks on Friday during an inspection tour of the National Administration of Traditional Chinese Medicine and the China Academy of Chinese Medical Sciences. "To explore the potential of the TCM, more should be done to improve its service network and service ability in the prevention and treatment of diseases and rehabilitation," Sun said. 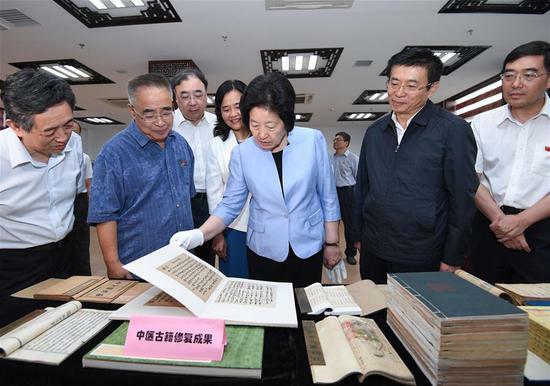 In addition to "systematic study and utilization of the country's fine medical books and skills passed on by senior TCM practitioners," she called for effort in TCM innovation. "Modern technology should be used to strengthen research on key equipment and drugs," according to Sun.